Nathan joined the True North team in June of 2014 as an intern. In the summer of 2016, he transitioned into a solidified position at True North. Nathan is the Public Relations and Marketing Manager for the True North team. He holds a bachelor’s degree in Public Relations from Wayne State University in Detroit, where he graduated in December 2015. 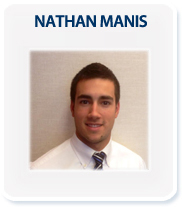 Nathan was also a collegiate athlete at Wayne State, playing baseball for the Warriors. His background in PR, communications and marketing make him an asset in his current position, handling marketing and special events for True North. Copyright © 2017 TrueNorth Logistics. All rights reserved.